The US border being just 25 minutes away, I decided to add a state to my list and go to Washington for half a day, the main purpose for the trip being a chance to fill my toad for about 15$ less than I can in Canada. Since I feel that you should always have something to declare upon reentry (looks less suspicious, even if you just spent 20$), I checked to see if there might be a Walmart Super Center nearby. There was! 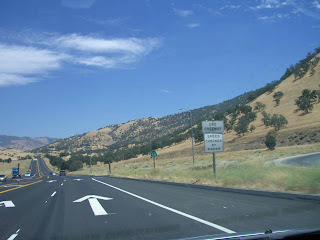 It’s in Omak, about an hour and a half away. I had no problems entering the United States. When asked when I was going home, I replied truthfully that I will be leaving Oliver in a week. For the first time, I was asked to pop open my trunk, but that was the only delay before entering my 26th state! 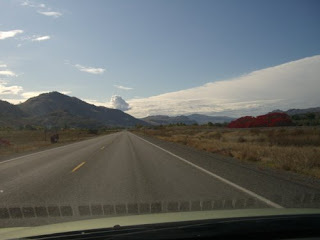 The scenery on the drive to Omak down the US 97 was breathtaking! I had lunch at Tequila’s in Omak, which promised ‘authentic’ Mexican fare. I have no idea if it was authentic, but it sure was good! My Spanish accent must be as good as my profs said it is since after ordering my ‘burrito a la crema’ (chicken cooked in sour cream and wrapped in a tortilla), the server only addressed me in Spanish! What a nice way to get a change of scenery while staying close to home! Crossing the border back into Canada was a non-event. I declared the 30 bucks worth of stuff I’d bought at Walmart (including a huge quantity of RV-friendly toilet paper, something I have not being able to find here), and did not have to pay any customs on my purchases. Wow. 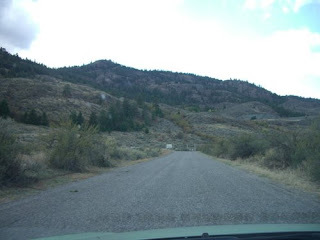 I sure didn’t expect to be here today, here as in the Okanagan Valley, here as in the capital of wine country, here as in the end of the road for the next month. Yesterday didn’t quite go as planned. By the time I stopped for the night, I was sure that I couldn’t possibly ever again have a worst day. By the morning, though, I was grinning and realising that nothing, absolutely nothing, will ever be as bad as that crunching day between Thunder Bay and Selkirk. 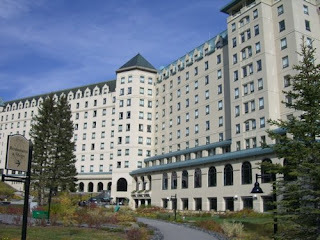 Cochrane is quite possibility the most beautiful full service town I have ever visited, even more beautiful than Banff. I could have easily stayed a few months there. I left the park almost two hours earlier than I had planned. I’m grateful that they had propane and gas fill up stations, so I was able to do everything there before pushing off. All of that, plus the one hour time shift and the week’s rest I just had meant that I was ready to drive if conditions warranted it. Tourism time had ended and it was time for me to get to work. I’d have plenty of time to come back into the mountains to explore in later months. So, I made it to past Revelstoke yesterday, about 480km, but it wasn’t a drudging sort of drive because I did make the time for two touristy stops, one of which was an hour and a half long. 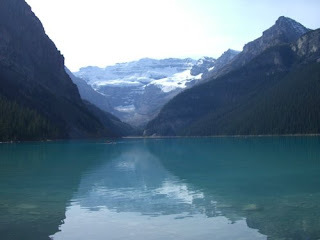 This stop was, of course, at Lake Louise. to look for ridiculously overpriced ice cream to munch on while I walked partway around the lake and was delighted to find merely overpriced ice cream. 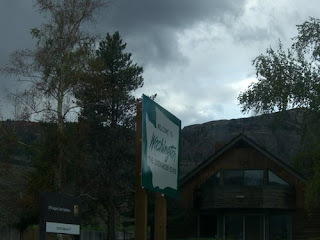 My first possibility for an overnight stop was the Kicking Horse rest area, just west of Yoho National Park. Unfortunately, it was only 3PM local time when I arrived there and there was blasting and other construction going on. So, I pressed on, surprised to find myself already going through Glacier and Revelstoke Parks. Just west of Revelstoke, I found what seemed like an informal truck stop, but it looked very busy and noisy, so I pressed on. Then, I found what seemed like the perfect stop to stop for the night. There was a rest area with a road leading down to a utility shed, with a large open area. It seemed private and quiet, so I decided to make that my stop for the night. Which is when I discovered that I had absolutely no power. Now, my batteries were fully charged, but no power was getting through to my 12V system. I check the terminals and my fuse box, trying to figure out what had happened in 5.5 hours to break my electrical system! It was about to get dark and I decided to drive 10km. If I didn’t find an RV park within that time, I would come back to this spot and tough out the night without power. As I drove, I suddenly remembered Croft’s suggestion that I try to start the generator with the truck engine running. 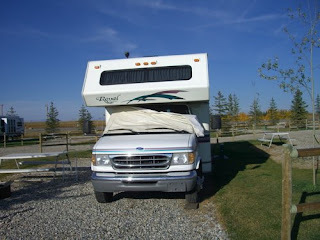 So, having passed two closed RV parks and being ready to turn around, I pulled into a rest area and tested his trick. It worked! I had power! Noisy power, but at least my fridge was running again. I decided to go back to my previously selected spot when I realised that I didn’t need to. This rest area was built a bit like a tea cup. I was parked in the bowl. 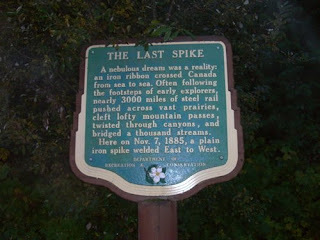 To the right of me was a thicket of trees and there was a narrow path going around this thicket, like a handle. I pulled into it and to my delight found myself tucked away out of sight of the road. It wasn’t as quiet as the other spot would have been, but at least I didn’t have to double back. It was fully dark now and pouring rain, so I was very, very grateful that my day of driving was done. I set to work making dinner, then I read for a couple of hours. I went to bed ridiculously early, about 8:30 local time, but it was 9:30 my time and I was beat! For a first time pulling off the road and sleeping in the middle of nowhere, I slept pretty well. I woke up around 1, then slept soundly again until 5. I ran the generator again for a couple of hours as I puttered around, waiting for it to be light enough out for me to set off. This kept most of the contents of the freezer frozen solid, thankfully, and used up only a negligible amount of gas. I can almost get used to the noise inside, but would hate to run the generator when there are people around! So, my first day in BC dawned like my first day in Manitoba, very rainy and foggy. I decided to drive until such time as the weather cleared up and run the generator again for about an hour for the fridge’s benefit, then I would make a straight run for Oliver where hookups would give me time to figure out what was going on with my electrical system. I was in a really good mood this morning. I’d slept well, had an indecently yummy cup of coffee while watching the sun rise at the rest stop, and realised that the part of my journey I had feared the most was over: I was clear across the mountains! Sure, part of the day before had sucked (driving in the dark in rain with no power and chicken about to thaw in the freezer), but, sum told, it had actually been quite a good day. I was especially proud of myself for being able to recognize a good place to stop and, most importantly, for not pushing myself any further than I absolutely needed to. And that was it for tourism. I drove quickly through Vernon and Kelowna, glad when I saw them that I wasn’t stopping there for my week of reconnaissance, and then I pulled over at a rest stop outside of Penticton for lunch (thawed out pizza that I hadn’t been able to stuff into the colder part of the freezer with all the other stuff that was still, thankfully, frozen solid). 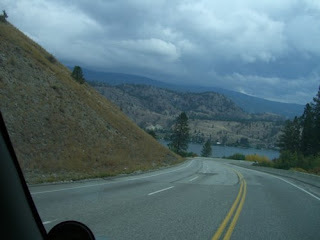 The Okanagan area looks quite like I expected it to, except for the hills which remind me of the Sierra Nevadas! 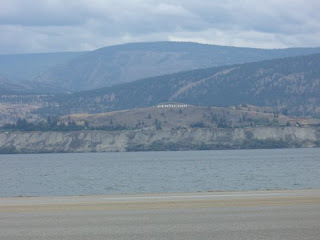 I’m now settled for a week just outside of Oliver, which is the wine capital of Canada. 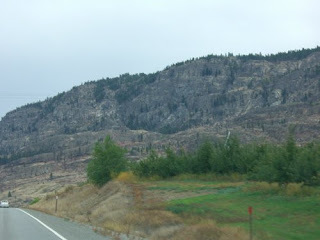 I passed too many wineries to count on the drive down here, so I think I’ll just start at the closest one to here and work my way south to Osoyoos, and then north again, asking at each one if they’re hiring pickers yet. Tomorrow, though, I just might take the morning for a wee bit of sightseeing as I am very eager to see Canada’s only (non-Arctic) desert. But, after that, it’s time to look for work! So, the first stage of my great big adventure has ended. I have successfully traveled the roughly 5,000km (not counting mileage done with the toad) that separated me from my old life in Gatineau to the new one awaiting me in the Okanagan Valley. I arrived here a lot less naive and cocky, but in excellent spirits and with a month’s worth of memories that make up for a lifetime of disillusionment. Now that my rig is well broken in and I am more knowledgeable, it’s time to think about finding work, a place to spend the winter, and a way to make Miranda comfortable during that season. In a way, I feel that my journey is still just beginning. Today is not an ending, just a really, really, really major milestone.